There are 46 days until the time will come for us to vote for the next President of the United States of America. Despite the choices, there are more hurdles to overcome as the day quickly approaches. During a voter's right roundtable, Congressman John Lewis called for federal observers to be on-site at polling stations on Election Day. “In past few months and years I’ve traveled across the country and I know that there is a deliberate persistent systematic effort to make it harder and more difficult for the disabled, student, senior, minority, the poor and rural voters to participate in the Democratic process. That’s not right, not fair, and it’s not just.” Lewis said. For years, states have walked the line of violating the constitutional rights of black communities preventing them from being able to exercise their voting rights. For example, the state of Alabama requires that the voter have a driver's license or other forms of photo ID to vote. With 31 satellite DMV offices closing across the state, most of who were located in black communities, it became an arduous task for black people to obtain the necessary identification to vote. States have also reduced the number of days for early voting and enforced even more registration restrictions. 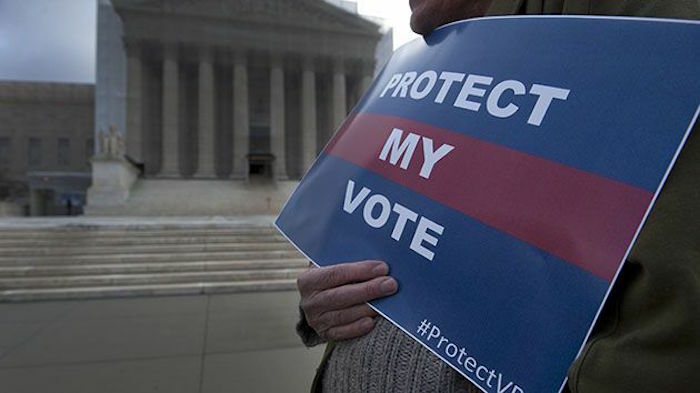 The Brennan Center for Justice takes a comprehensive look at states with harsh voter restrictions that have increased since 2010. The states hardest hit by these restrictions are: Alabama, Arizona, Indiana, Kansas, Mississippi, Nebraska, New Hampshire, Ohio, Rhode Island, South Carolina, Tennessee, Texas, Virginia and Wisconsin. And we can't forget about the controversial voter ID law that North Carolina tried to get away with. In 2006 the federal government sent sent 800 monitors to 20 states, this year that number has dropped drastically. The federal government will only be able to send observers to five states. The concern that Congressman John Lewis has is well warranted and shows that we have 46 days to figure out how to make our voices heard even if the federal government won't protect our vote. Stay connected to all things Black Twitter, news and the best content on the Internet by signing up for Blavity's newsletter.